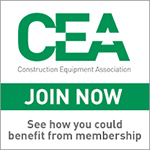 The CEA is the owner of the CESAR Scheme (Construction and Agriculture Equipment Security and Registration scheme) – the most successful programme of its kind in Europe. The Scheme now in its tenth year was initiated in 2007 with the support of the Home Office and the Police to tackle an estimated £400 million plant theft problem in the UK. 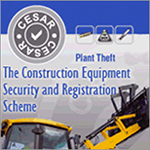 Today CESAR sits at the heart of a national crime reduction programme which has resulted in the fact that CESAR registered plant is six times less likely to go missing and four times more likely to be recovered if stolen. Since launched CESAR now protects over 250,000 items of plant and machinery and has also been extended to cover agricultural plant with the support of the Agricultural Engineers Association (AEA). CESAR is powered by Datatag ID technology that includes both overt and covert markings including the now iconic CESAR warning triangle, unique RFID ‘tags’, microscopic Datadots and forensic chemical DNA solutions. The physical markings are backed up by a comprehensive database of marked machines accessible 24/7 through the secure contact centre. This layered approach has been the secret to the scheme’s success as it is virtually impossible for a criminal to find and remove all trace of the original keeper and thereby avoid prosecution. CESAR is a proven deterrent against theft as thieves immediately recognise the distinctive triangular registration plate and steer clear. CESAR is accredited and supported by a wide range of organisations including the NPCC and has the full support of leading insurers. The list of manufacturers who fit CESAR as standard continues to grow and to date CESAR is standard fit on over 70 of the construction and agriculture markets biggest brands. 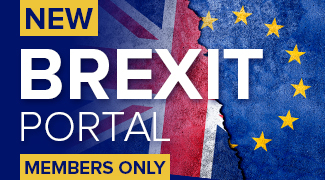 Of those who do not fit as standard many offer CESAR as an option or they may nominate approved distributors to undertake the fitting of CESAR on new equipment and that plant already in operation. Visit the CESAR website at www.cesarscheme.org. For all the latest CESAR information visit www.cesarscheme.org.